Shifen Waterfall is a scenic waterfall located in Pingxi District, New Taipei City, Taiwan, on the upper reaches of the Keelung River. 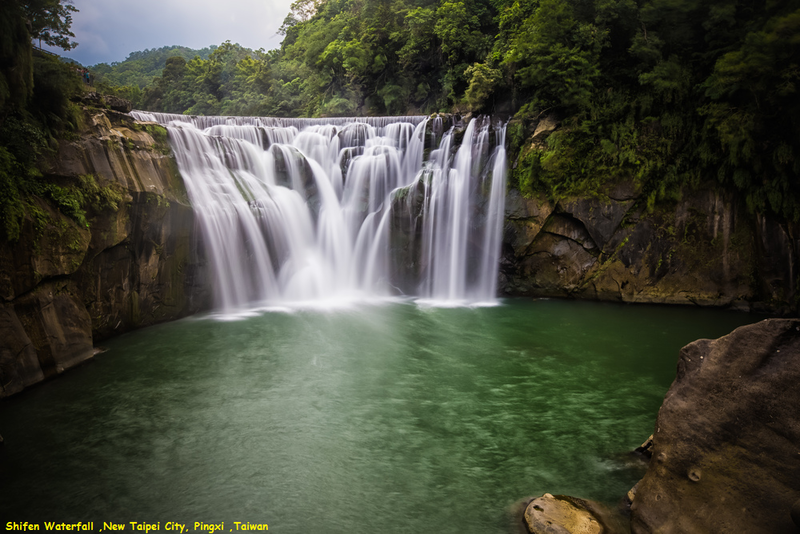 The falls' total height is 20 metres (66 ft) and 40 metres (130 ft) in width, making it the broadest waterfall in Taiwan. It is a cascade waterfall in which the water flows in one direction and the rock is sloped in the opposite. Shifen Waterfall is one of the most famous in Taiwan. It forms a horseshoe and has been nicknamed the Little Niagara even though it is much, much smaller. Shifen is a very popular stop along the historic and stunning Pingxi Railroad. The hike – It is a 15 minute walk east from the town/station to the waterfall with plenty of signs (some in Chinese) along the way. You cannot drive to the waterfall. Alternatively you can do the longer Sandiaoling Waterfall Trail and get off the train in Sandiaoling. It will probably take about 3-4 hours to complete the trail including some time at Shifen Falls.